Anyone who enjoys food and wants to feel great will love this book. In simple, direct language, the authour presents a wealth of easy-to-digest health tips and over 70 fabulous meat-free, sugar-free, egg-free, and dairy-free recipes guaranteed to soothe your nerves and energize your life. ISBN 1-896182-63-1. Size: 6 x 9 paperback, 143 pages spiral bound. GSPH. A hopeful and humorous look at the next 30 yearsto the world beyond petroleum. A world beyond petroleum needn't be a scary propositionit can be something to relish. 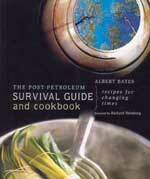 As we move from a global culture addicted to cheap, abundant petroleum to a culture of compelled conservation, the Post-Petroleum Survival Guide and Cookbook provides useful, practical advice for preparing your family and community to make the transition. Also featuring playful recipessome using basic, wholesome foods, some illustrating food growing or preservation, and all emphasizing organic, flavourful and locally grown produce that readily substitute one for anotherthis book is about having your catastrophe and eating it too. ISBN 0-86571-568-8. Size: 7 1/2 x 9, 236 pages paperback. New Society.